Complex relationships exist between water and the security of individuals, communities, nations, and the global community as a whole. The vital role of water in daily life and economic activity underscores its importance to a secure and stable world. Water resources and the provision of water services involve political decision-making, and extreme types of conflict can escalate into violence, terrorism, or war. Gleick (2000) provides a timeline of water conflicts throughout history, categorizing them according to the basis of the conflict and the actors involved. State and non-state parties fight over water supplies or access to water supplies (control dispute). Nations use water resources or water systems as a weapon during a military action (military tool). State and non-state parties use water resources or water systems for political goals (political tool). Non-state parties use water resources or water systems as a target or tool for violence or coercion (terrorism). Nations use water systems as a target for military action (military target). State and non-state parties argue over water resources or water systems in the context of economic development (development dispute). Military and terrorist actions are of particular concern to security experts and those who are responsible for managing water resources and water systems. Concerns over the potential for water-related military and terrorist action are not new. For example, in 1941, J. Edgar Hoover, director of the Federal Bureau of Investigation, wrote that "water supply facilities offer a particularly vulnerable point of attack to the foreign agent . . . . " The end of the Cold War served to heighten concern for the nation's critical infrastructure , given its importance to national security interests. World history includes many instances of water resources being used strategically during military conflicts. Nero used cherry laurel water, which contains cyanide, to poison the wells of his enemies in ancient Rome (first century C . E .). Leonardo da Vinci and Machiavelli planned to divert the Arno River away from Pisa during conflict between Pisa and Florence (1503). General U.S. Grant cut levees during the Civil War siege of Vicksburg (1863). Chiang Kai-shek ordered destruction of flood-control dikes in theHuayuankou section of the Yellow River in China to flood areas threatened by the Japanese army (1938). The German army released waters from the Isoletta Dam on the LiriRiver to destroy British forces crossing a downstream river. They then dammed the Rapido River to flood a valley occupied by the American army (1944). Damage to, or poor maintenance of, watersupply infrastructure and appurtenances (e.g., hydrants) can prevent or impede the provision of essential services, such as firefighting. With the rise of terrorist activities, societies are increasingly concerned about intentional disruptions to water systems. The United States bombed irrigation systems in North Vietnam and661 sections of dikes were damaged or destroyed (1960s). Israel led two raids to destroy the newly-built East Ghor Canal inJordan due to suspicions that Jordan was overdiverting the Yarmouk River (1969). Iraq threatened to bomb Syria's al-Thawra dam, alleging that it had reduced the flow of the Euphrates River to Iraq (1974). NATO shut down water supplies in Belgrade, Yugoslavia and bombed bridges on the Danube River to disrupt navigation (1999). Clearly, water resources and water systems are considered instruments of war by nation-states and their armies. The security of water resources and water systems is vital to any nation's interests. This national security perspective is magnified when non-state actors carry out terrorist actions. Terrorists undertake extreme actions to achieve their political goals. The number of terrorist-type groups is growing and their methods are becoming more extreme. The terrorist potential in a globalized world was starkly illustrated by the September 11, 2001 attack on the World Trade Center in New York and the Pentagon in Washington, D.C.
Environmental terrorism refers to the unlawful use of force against environmental resources to destroy public or private property and deprive citizens of their benefits. This type of terrorism targets natural resources for destruction or alteration, as opposed to more traditional human-built targets such as buildings, roads, and vehicles. As with all types of terrorism, one of the underlying goals of environmental terrorism is to impose psychological trauma on the targeted population. Environmental terrorism is a concern to the government as it can potentially have even more significant consequences than conventional terrorism, and it can be carried out with conventional weapons (as opposed to weapons of mass destruction). The potential for disrupting society and causing human deaths is substantial. Directing conventional weapons against environmental targets can cause greater human health and economic damages with lower risks to those carrying them out. As environmental scarcities increase, the potential for damage to natural resources takes on even greater importance. Water resources and water systems are viewed as vulnerable to terrorist attack for several reasons. First, they are vital to everyday life and economic activity. Thus, if disrupted or altered, the action has a great impact on society and would garnish a great deal of publicity as a result. Second, they have played a prominent role in military history and terrorists often model their strategies from military-type operations. 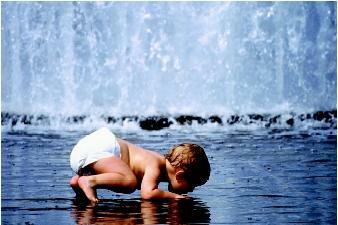 Third, water resources and water systems are typically very accessible to the general public. This is especially true of distribution systems and reservoirs. Many large dams even are tourist attractions. For these reasons, water resources and water systems can be viewed as both a tool for and target of terrorist actions. Water resources and water systems are viewed as targets for terrorist attacks for the same reasons they are targets during periods of war. Water resources are a prime infrastructure target for destruction or compromise by terrorist acts. For example, terrorists could attempt to blow up a dam to flood a particular area. The psychological impact of such an act would be very great. However, it would take a very concerted effort to blow up a large dam. With a relatively small explosive device, terrorists would not be able to cause significant structural damage to an entire dam. However, they could target the spillway gates to cause significant flooding downstream, or try to flood the dam itself to interrupt power generation. Pumping stations could also be targeted. 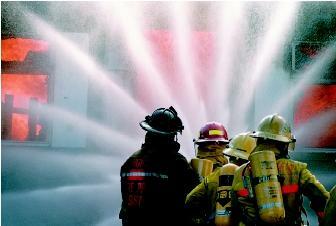 Loss of flow and pressure would not only affect water customers, but wreak havoc with firefighting abilities as well. Chlorine containers, used in water treatment processes, could also be targeted. Another concern is if terrorists were able to rapidly open or close major valves—an action that would result in numerous main breaks throughout the system. Backflow also is a serious concern. A public water system has relatively unprotected access to the distribution system at certain locations. Given sufficient understanding of water systems, a terrorist could distribute toxic chemicals throughout a neighborhood or pressure zone without detection in most places. These potential actions would rival natural disasters in the stresses they would place on those responsible for the systems and those receiving services from them. Using water resources and water systems as targets can potentially disrupt the availability and delivery of water. This is a credible threat in today's world. In 1999, for example, engineers in Pretoria, South Africa discovered a homemade bomb in a water reservoir that was of sufficient size to damage the dam; fortunately, the bomb malfunctioned. Hydroelectric dams and associated facilities may become a target of terrorists or combatants. 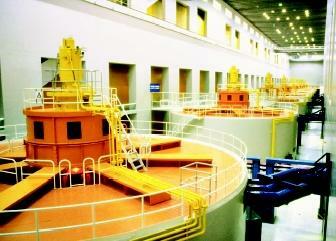 These turbines inside the Bonneville Dam powerhouse on the Columbia River represent large-scale power generation afforded by large dams and major rivers worldwide. Smaller-scale hydropower facilities similarly are at risk. Given potential risks, generalized fears are present in the public over such events. This fear was demonstrated in 2000 when a disaster preparedness drill in California almost set off a mass panic throughout the state. The drill simulated the destruction of the Lake Nacimento Dam in central California, and the mass media had to be called in to counter the resulting widespread panic. Water can also be used as a tool or weapon of terrorism. Because it is fluid, water can be used as a delivery vehicle to carry destructive agents throughout the ecosystem, water system, and to human and animal populations. Destructive agents could include microbiological agents—bioterrorism—or toxic chemicals. For example, terrorists could drop a concentrated water-soluble contaminant, chemical or biological, near an intake pipe. In the best-case scenario, the contaminant would be detected as it entered the water treatment plant. The plant would be shut down while the contaminant was neutralized, and potable water service to the area would be interrupted temporarily. In the worst-case scenario, the contaminant would go undetected and would affect the health of water users, and potentially cause significant health and economic damages. Rivers and water supply reservoirs are particularly vulnerable to this type of contamination attack. Society also has seen the damages caused by nonterrorist occurrences involving microorganisms. The 1993 Cryptosporidium outbreak in Milwaukee, Wisconsin killed over a hundred people, affected some 400,000 more, and was estimated to have caused over $37 million in lost wages and productivity. A larger city with a larger water system could have incurred much greater human and economic losses. Water is not only a backdrop for security issues, but also a central factor for human health and survival. Infants and children, particularly in developing countries, are especially vulnerable to health risks posed by water scarcity and water contamination. Governments are accelerating their efforts to protect water systems, and hence their citizens, from strategic attacks. Although attack by aerosol contamination is considered the most serious terrorist threat, the possibility of waterborne contamination is increasingly feared. The Centers for Disease Control lists the following as Category A biological agents of high concern: smallpox, anthrax, botulinum toxin, tularemia, and hemorrhagic fever viruses. Under certain circumstances, these biological agents and toxic chemicals could be considered as weapons of mass destruction. Experts view the physical destruction of a water system's components as increasingly more likely than contamination events because explosives are relatively easier to obtain than sufficient quantities of contaminants. Due to these potential terrorist threats, resource managers and security officials are undertaking new ways of protecting natural resources and deterring terrorism. Even prior to the events of September 11, 2001, the security aspects of water resources and water systems were a national priority. In 1998, President's Decision Directive 63 established the National Infrastructure Protection Center, and made the U.S. Environmental Protection Agency the lead agency responsible for the water-supply sector. Large public and privately owned water utilities are required to undergo vulnerability assessments to evaluate their risks and vulnerabilities to terrorist attacks and efforts to prevent them. A national Critical Infrastructure Protection Advisory Group began meeting early in 2001 and set up an Information Sharing and Assistance Center to coordinate threat information. Congress has allocated funds to support counterterrorism efforts in the states and at drinking water and wastewater utilities. The Environmental Protection Agency has disseminated information on strategies for large, medium, and small utilities to counter terrorism. Training is being offered in cooperation with research centers and associations to educate utility officials in conducting their vulnerability and risk assessments. These efforts will put procedures into place that will help prevent, assess, and respond to attacks, as is done with natural disaster-preparedness planning. These counterterrorism efforts are vital to the future security of water systems and water supplies. Duffield, Mark R. Global Governance and the New Wars: The Merging of Development and Security. New York: Palgrave Macmillan, 2001. Friedman, Thomas L. Longitudes and Attitudes: Exploring the World After September 11. New York: Farrar Straus & Giroux, 2002. Grigg, Neil S. Surviving Disasters in Water Utilities: Learning from Experience. Denver, CO: American Water Works Association, 2002. Counterterrorism Office. U.S. Department of State. <http://www.state.gov/s/ct/> . Denileon, Gay Porter. "The Who, What, Why, and How of Counterterrorism Issues." American Water Works Association, 2001. <http://www.awwa.org/Advocacy/public_ep/may.pdf> . Gleick, Peter. "Water Conflict Chronology (September 2000 Version)." Pacific Institute. <http://www.worldwater.org/conflict.htm>. Hickman, Donald. "A Chemical And Biological Warfare Threat: USAF Water Systems at Risk." Maxwell Air Force Base, Air University (U.S. Air Force). <http://www.au.af.mil/au/awc/awcgate/cpc-pubs/hickman.htm> . National Infrastructure Protection Center. <http://www.nipc.gov/> . Security Resources. Association of Metropolitan Water Agencies. <http://www.amwa.net/security/> . Water Infrastructure Security. U.S. Environmental Protection Agency. <http://www.epa.gov/safewater/security/index.html> . URGENT! Last night, the FBI received a signed threat from a very credible, well-funded, North Africa-based terrorist group indicating that they intend to disrupt water operations in twenty-eight U.S. cities. Because the threat comes from a credible, well-known source, with an organizational structure capable of carrying out such a threat, the FBI has asked utilities, particularly large drinking-water systems, to take precautions and to be on the lookout for anyone or anything out of the ordinary. This threat turned out to be a hoax, yet it highlights how seriously the U.S. government and the water industry treat the possibility of such terrorist attacks.